This Time the Pandas were ALIVE! As I promised, this blog post is about the cutest of all creatures – LIVE pandas. Why the stress on the “aliveness” you may ask…let me explain…. 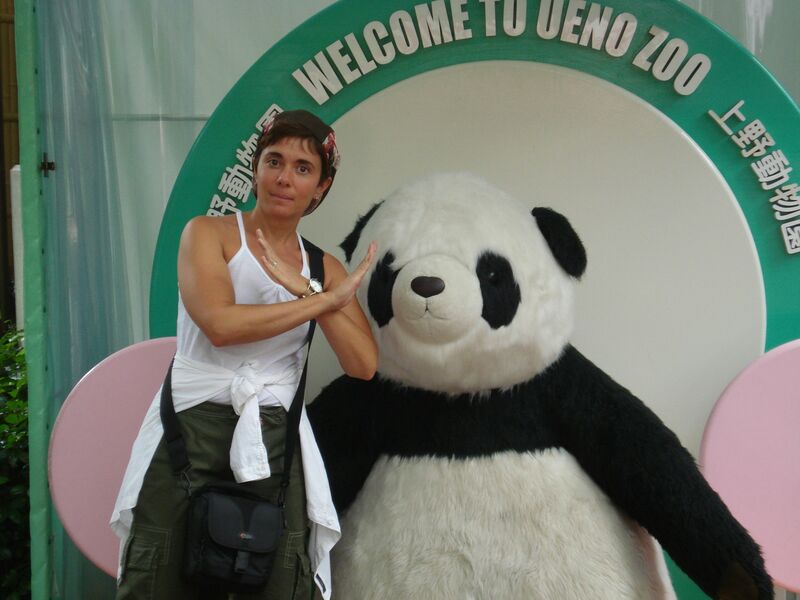 For those of you that have been following this blog (or my adventures) for a while, you might remember an ill-fated trip to the Ueno Zoo in Tokyo, where, after much panda-phanelia hoopla we were unceremoniously (well, a little ceremoniously) informed that the panda was dead (and told to have a nice day at the zoo). You can read about it in my post about Japan (or simply scroll to the bottom where I cut-and-pasted the relevant part). In any case, unlike my love of Shake Shack burgers, my desire to see a cuddly (live) panda remained unrequited – that is until last weekend. Steve planned a surprise birthday weekend in San Diego, mostly to see the sea and eat seafood, but where, coincidentally, 3 of the 12 pandas in the U.S. live! San Diego Zoo, here we come! So, until this trip I knew nothing about the San Diego Zoo; I could not believe it when I read online that the tickets are $54!!! For those of you also previously unfamiliar with the zoo, once you’ve been there you get the ticket price (mostly) – this place isn’t a zoo, it’s animal Disney! In any case, the Universe decided to be generous to me – either for the disappointment I felt at the Ueno Zoo a decade ago, or maybe just for the “ack” year that was 2017 – either way, I got a panda-stravaganza! After trying to catch glimpses of the mom panda walking back-and-forth in her area (cute, but…), we finally snapped that just a little further down there was much more excitement to be had – the youngest panda (Xiao Li Wu) was about to eat lunch! While I know the pictures below probably don’t do it justice, this adorable panda just sat there and ate bamboo and played in bamboo and basically acted as adorable as if he were starring in all the adorable viral panda videos (yes, I am overusing the word “adorable” on purpose). And just to make it a little more fun was the hysterical (unintentionally) docent, who after making it very clear that she was NOT a volunteer and had been doing her job for 21 years, proceeded to tell us of all the ailments and less pleasant aspects of the pandas (things like the fact that the father panda gets acupuncture for his arthritis on Tuesdays, and how much “food” comes out of pandas). In such a fancy zoo with such an amazing exhibit you’d expect someone peppy telling you all the great facts about how adorable the pandas are….maybe because that part needs no explaining (or maybe because after 21 years the adorableness eats at your soul), this docent preferred to tell us how the pandas would rip our faces off if we tried to cuddle with them. In any case, her banter somehow only added to the experience (an appeal to Steve and my respective dark senses of humor), and she seemed unfazed when I motioned for permission to snap a photo of her instead of the panda (below). (And, oh, yes there was an adorable baby koala and other cute things…..). Enjoy! The pandas are so cute!! They genuinely seem like the most cuddly, carefree, and happy animal. Thank you for sharing! The daily ticket price is why I have an annual pass. It’s 3 times the price of the daily price but I go once a week, so I get in 49 times for free! Thanks for stopping by! I’d do the same thing if I lived there!